Store shelves of neon signs displaying various sayings; image by Kokil Sharma, via Pexels.com. Whether they bring back memories or simply catch your eye, there’s no denying that neon signs have an impact on people. Business owners may find that using neon signs attracts more customers. Many brick and mortar business owners mistakenly believe that using neon signs is out of style. Three things in particular make most local business owners apprehensive to installing neon signs, none of which are very accurate. The first thing they think of is that neon signs are out of date. With the first neon signs existing as far back as the 50s, most business owners foolishly believe that these signs are still a thing of the past, fearing that they will be seen as out of touch if they were to set them up. The second thing most business owners foolishly believe is that neon signs present a negative stereotype. When they think of neon signs, they usually think of entertainment venues, such as nightclubs or even adult entertainment venues. While these locations do contain neon lights, other places do as well. The third thing has to do with setting them up and installing them. Most business owners do not understand that installing neon lights is virtually the same as installing any other kind of light. The exact same kind of effort is necessary. With these objections out of the way, here are some reasons why neon lights should be part of your establishment. Humans are a very visual species. Of our senses, the one that is on autopilot nearly all of the time is sight. If your establishment has neon lights, it will take advantage of this fact, as the establishment will “pop out.” This is exactly why entertainment venues are loaded with neon “Open” signs. The owners of these establishments know that these lights will attract anybody. 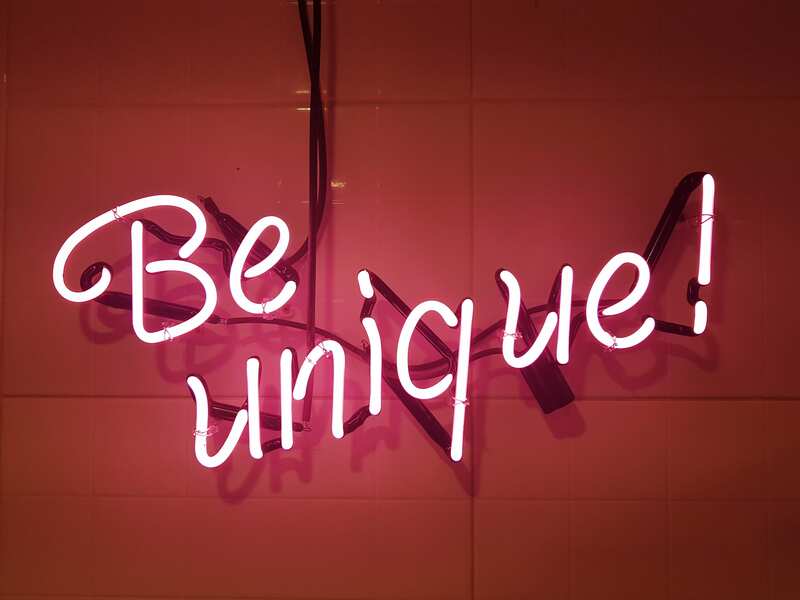 Pink neon sign on wall saying “Be Unique.” Image via PxHere.com, CC0. Branding is important for nearly any establishment, bigger ones in particular. Because they are customizable, neon lights will not only make your establishment more visible, but when they are installed, it will not be at the expense of your branding. Again, look to the example of most entertainment venues. They use neon lights, and their branding is unaffected; enhanced, even. While they do cost a bit up front, neon lights will save a lot of money in the long term. Because they use neon electrodes to operate instead of filament, they last much longer than fluorescent lights. Because neon electrodes use less power than filament, neon lights will save on energy costs in a big way. Though they are designed to provide outside lighting during the night, neon lights are effective both inside and outside of any given establishment. Neon lights also last quite a long time, and can save money in that aspect as well. Neon lights are also not as dangerous as many think, as they have a wide range of operating. They are also durable, making brownouts and surges much easier to manage. One struggle for small businesses is that they may not have the money to hire professionals to set up lighting. Fortunately, setting up and installing neon lights is not as difficult as many would believe, and it is fairly easy to install with just a few DIY tactics. Some neon lights are already constructed, making it possible for anybody who isn’t a technician to install them. Because it is not as trendy as it once was, neon lights will make your establishment stand out in more than one way. Also, because of our culture’s current trends of embracing “throwback” materials and culture, there is no telling when neon lights will become trendy again. Given our latest love affair with the past, this could happen at any moment. Installing neon lights will put you ahead of this curve.